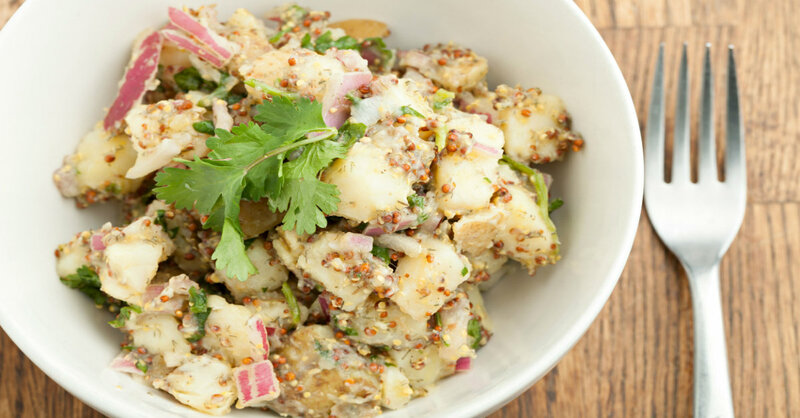 The Slow Cooker Gets Us Every Time…This Potato Salad Is Unbeatable!! Potato salad, to us, is the crux of any summer gathering. We love hot dogs and hamburgers and fruit salad, but a backyard bash isn’t really anything at all if you don’t have those tots. Here, we’ve got an awesome recipe for you for when it’s hot out; we don’t like standing over a pot of boiling water, so it’s the perfect time to throw everything in the slow cooker, and this german potato salad hits the spot every time. Without any mayonnaise, this variation is tangy and refreshing…definitely not to be missed! In a small bowl, whisk together mustard and flour until combined, then stir in cider vinegar. Place potatoes and onions in slow cooker and pour mustard vinegar mixture over the top. Season with salt and pepper and stir everything together. Turn slow cooker on LOW and cook for 5-6 hours, or until potatoes are fork tender. Turn off heat and stir in fresh parsley or dill before serving, then serve warm or refrigerate until chilled.